Jerusalem, the Covenant City explores the past, present and future destiny of Jerusalem in the light of recorded history, the prophetic Scriptures and current events. Jerusalem is the only city in the world to have its history written in advance. It is the only city in the world that the Creator of the Universe has declared to be His dwelling place forever. And it is the only city in the world with an eternal destiny. This feature-length documentary, presented by Lance Lambert, provides a biblical lens for understanding current events in the Middle East. The film is divided into two parts for viewer convenience. Part 1 contains a broad sweep of Jerusalem’s history, while Part 2 examines the present and future destiny of the Holy City. Each DVD contains both parts. The total running time is just under two hours. 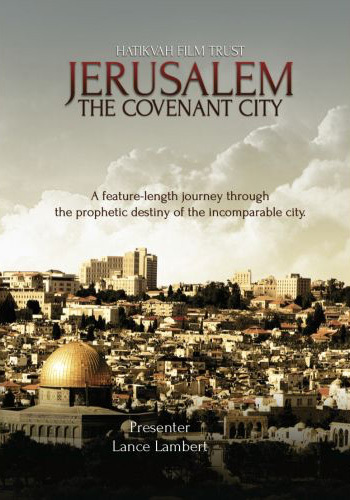 Jerusalem the Covenant City from Hatikvah Films on Vimeo.